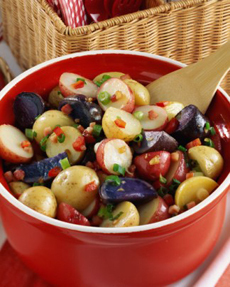 Whenever we’re asked to a July 4th party, we always bring our Red, White & Blue Potato Salad. It’s special on Independence Day and potato salad occasion. While we generally enjoy sharing, we keep our exact recipe a secret. We worked for years to get the dressing right! But the United States Potato Board sent us a substitute red, white and blue potato salad recipe. It mixes three different potato types with onions, bell peppers and ham in a balsamic vinaigrette. This fancy potato salad is a world away from a potato-mayonnaise mix, a delight for potato salad fans. The recipe was created by Jill Melton, MS, RD, former senior food editor of Cooking Light and director of communications for Food Insight. We had bacon on hand and substituted it for the ham: delicious! A potato salad for any festive occasion. Photo courtesy U.S. Potato Board. 1. Cut the potatoes into 1-1/2 inch pieces (do not peel). Steam for 25 minutes or until potatoes are tender. 2. Heat 1 tablespoon oil in a medium skillet. Add ham, walnuts, and garlic. Sauté 10 minutes. Add sherry vinegar, stir well. 3. In a large bowl, toss ham mixture with potatoes, additional 2 tablespoons of oil, red pepper, green onions, salt and pepper. Serve warm or cold with grilled steak, burgers, chicken or fish. *Creamer potatoes are potatoes that are harvested while young, tender and small—often as little as one inch in diameter. The flesh contains a lower level of starch, which makes themsuitable for boiling. 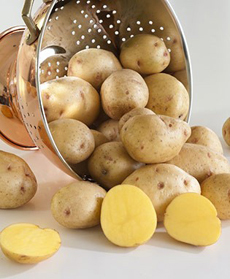 Creamer potatoes are typically Yukon Gold or red potatoes, which are called gold creamers or red creamers, respectively. Find more delicious potato recipes from the U.S. Potato Board. According to the USDA Economic Research Service, potatoes are the largest vegetable crop in the U.S., with an annual production of 41.3 billion pounds. More than one million acres of potatoes planted annually—the equivalent of filling the entire state of Rhode Island with potato plants.